I heard this one on the Smøla site on July 23 with quite a good signal. Friendly response overnight from Elias, their web and social media guy. Always cool to receive a MW QSL from Peru. Good signal from Radio 2 on July 25 at Smøla. Detailed and friendly response this evening. Argentine stations were getting out well at this time. One of the most often heard stations from Argentina, so it was time I opted for a QSL. Friendly fb-message this afternoon. All Argentine radio stations (on MW anyway) play the National Anthem at local midnight, that's 03:00 UTC. They come in all different versions and lengths, and the version provided by Radio Provincia is stunningly beautiful. Surfaced on July 25 on Smøla with a fine ID and their web site. Swift response this afternoon, along with a photo of their station building and towers. 5 kW. Thanks Alejandro Alvares for info. Heard in Kongsfjord during the KONG31 expedition in October 2015, I was lucky enough to receive a confirmation today. I'm not really a classic radio collector. That said, I do have four of Norway's finest classic radios displayed in different rooms in my Kongsfjord DX location; Two Radionette and two Tandberg Huldra radios. With perfect chassis and (all except one) in perfect working order. The Tandberg Huldra series was the high-end receiver of the day, and too expensive for the average household. 12 versions were made from 1934 until the last model 12 rolled out of the production line in 1983. My Huldra is model 11, which was in production from 1976 to 1978. 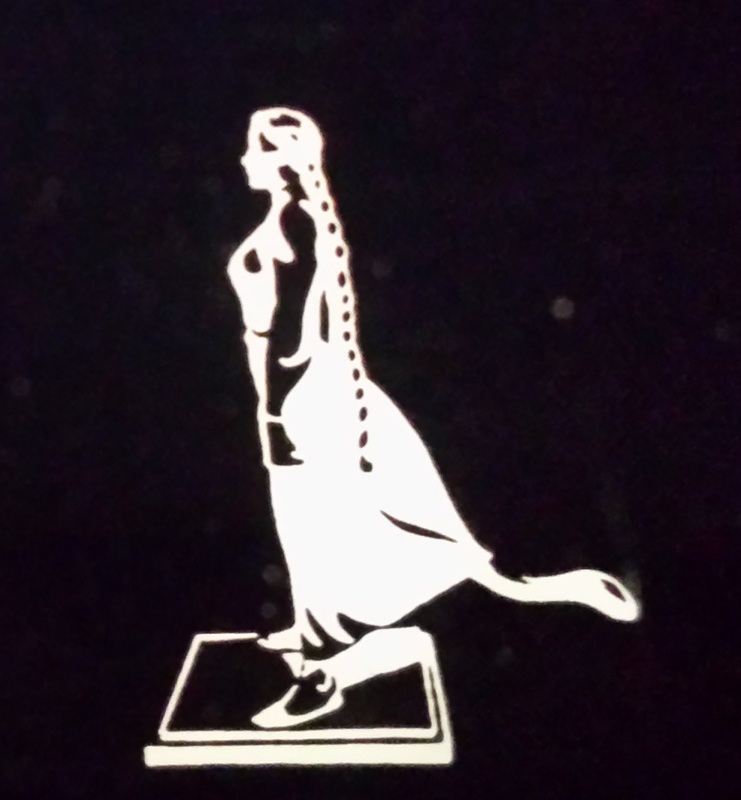 The Huldra logo may need an explanation for people not familiar with Norwegian folklore (including, I'm sad to say, most Norwegians). The Huldra is a supernatural woman, usually portrayed as a young girl with long, golden hair and a cow's tail. In many tales she's wealthy, and often seen herding particularly healthy and well fed cows. 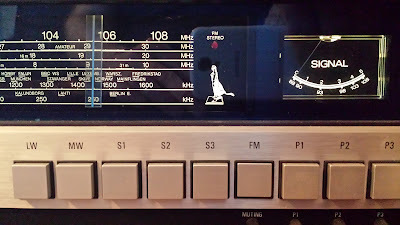 Why Tandberg chose the Huldra to brand their high-end receivers is unknown to me, but perhaps there was an association with beauty, wealth and quality. How knows. The Huldra as displayed on the Huldra 11. The Huldra 11 had a radio section and a 2 x 20 watts amplifier section, with DIN inputs for two tape recorders and a turntable. It supports two pairs of speakers in Stereo. 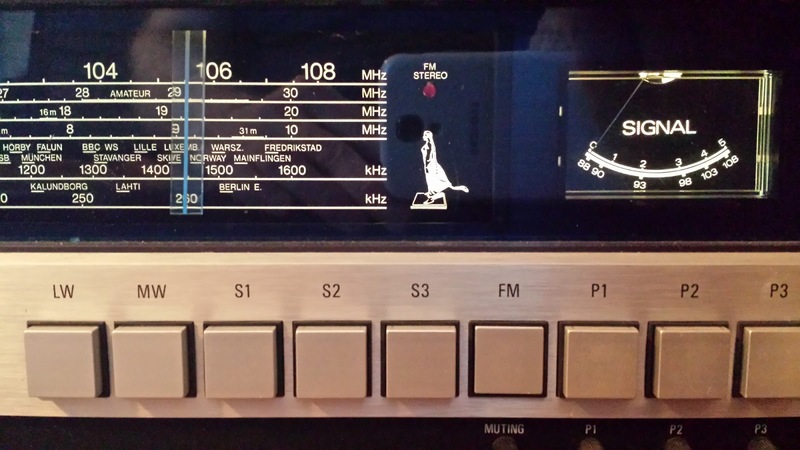 It was the first receiver in Norway to have an LED FM stereo indicator. Coverage is Longwave, Mediumwave, three Shortwave bands and FM. It has two antenna connectors, one for AM and one for FM. I don't know the AM antenna impedance, but I suspect that it is 400-600 ohm, since it was common at the time to connect the longwire directly to the antenna input. Back in the days, radios were regarded as furniture much more than today. This receiver would be an asset to any household. Band selection was done with square push buttons. The row in the picture below shows LW, MW, three SW bands, FM and three FM presets (P1...P3). Preset tuning knobs below were tuned with the SIGNAL meter doubling as a preset tuning dial. The Huldra 11 was sold abroad as well, and was marketed in North America as the Tandberg TR-2025. Longwave and Shortwave bands were omitted from the export model. In the 1970's, FM almost completely replaced MW as the preferred broadcast listening band in Norway. After the Huldra series, the focus shifted almost entirely to FM. Tandberg engineers succeeded in the difficult task of making good selectivity in combination with good audio quality. It appears to be very sensitive as well. One day I might do some measurements. To be fair, my Tandberg Huldra 11 is not used a lot. DAB has replaced FM. There is only one AM station with a good groundwave signal here (NRK Ingøy 153 kHz), and MW and SW stations are monitored on my SDRs. But it's still a brilliant piece of furniture, built in a time when there was still some margin before the bottom line turned red. Heard with fair strength on January 30 in Kongsfjord. Friendly response today. Heard in November 2015. The verie signer commented: "The ID that you heard was one that I recorded personally, so it's thrilling for me to hear your recording from Norway!" Long time, no QSL. Today though, a follow-up resulted in a brief email verie.